Looking to stay warm and fashionable at the same time? Look no further. 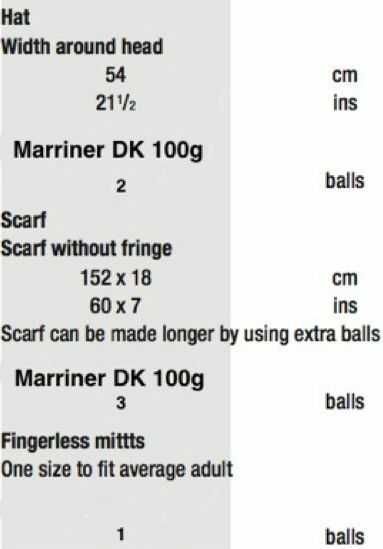 This Marriner Double Knit Hat, Scarf and Mitts combo is ideal for the fashionable at heart throughout the winter season. Knits best with Marriner Double Knit. Hooks required Hat 2-31/4mm (UK10-USA4) and 2-4mm (UK8- USA 6) Knitting Needles. Scarf 2 - 4mm (UK 8 - USA 6) Knitting Needles. 1 - 4mm (UK 8 - USA 6) Cable needles. Mitts 2-31/4mm(UK10-USA4), 2-33/4mm(UK9-USA 5)and2-4mm(UK8-USA6) Knitting Needles.